This week was the week that the girls' room had it's very own Day of Reckoning. Because it was feeling rather left out since the boys' room and my room got all spiffied up. What a project! Their room is tiny. Maybe 10' by 10'. But, you'd be amazed at the amount of stuff they have crammed in their. Move over IKEA! I'm amazed. And not in a good way. How in the world did I end up with 4 packrats for children? It is a mystery to me. My motto is something in, something out. My offspring seem to live by there's always room for more. All the randomness. Papers. Art projects. Little hunks of garbage. McDonald's toys. (we don't even eat at McDonalds!). Doll clothes. Dress up clothes. Stuffed animals. Dishes. Broken toys. Magnets. Legos. Well, I took over 2 kitchen liner trash bags' worth of stuff out of that room. It looks much calmer and pulled together. I sorted their drawers and got rid of stained and outgrown clothing. I scrubbed walls. I scrubbed windows. (they are actually transparent-surprise, surprise) I applied some elbow grease. I didn't do any painting. But, I decided to do some painting. There are some cracks that need more professional attention than I can give them, and then I will be painting their ceiling and walls. It's been almost 4 years. And 4 years for a paint job in a kid's bedroom is the equivalent of a light year. LC will probably lobby for pink walls, but I think I will try for a very similar shade to what is already there. Is is a very light blue that looks almost purple in the sunshine. Very girly, but very subtle. No high-gloss layers of pink in this house! Speaking of the girls to whom this (now clean) room belongs...they've been cracking me up lately. And driving me nuts. Meres decided to move up to LC's bed, and they have been bunking together for the past few weeks. I have no idea why, I just know that's what is happening. Good news is that she falls asleep way faster with her sister than in her own bed. The desire to share a bed could have something to do with the fact that they shared while we were in Spain, and just kind of got used to it. I love seeing them in the early mornings. Quite often LC has her arm draped over her sister, snuggling up close. So sweet. Meres also has finally been fairly consistently dry at night for the past couple of weeks. Finally! It may have something to do with the fact that I am not above bribery. We bought her a big bag of gummy bears and she gets 5 every morning if she is dry. She has been dry every night but one (and that was barely wet) in the past 10-12 days. Two of my kids potty trained and immediately stayed dry at night. Two had the potty training down for quite a while, but took longer for night time. I decided to not sweat it with Meres, but to keep buying pull-ups. How nice to be over this stage! If it sticks. One last anecdote to make you chuckle...Meres has this unique way of saying, "I like your _____" She kind of sing-songs it. Last week I was cutting Freckle's hair and she pipes up to him, "I like your face. I like your polka dots." (i.e. freckles) It made me laugh. And I am pretty sure Freckles was tickled despite himself. So, I made another stir-fry. My family loves stir-fry. They love using their chopsticks that we picked up in Japan. I love the ease and convenience and healthy factor of it. This stir-fry is pretty basic. 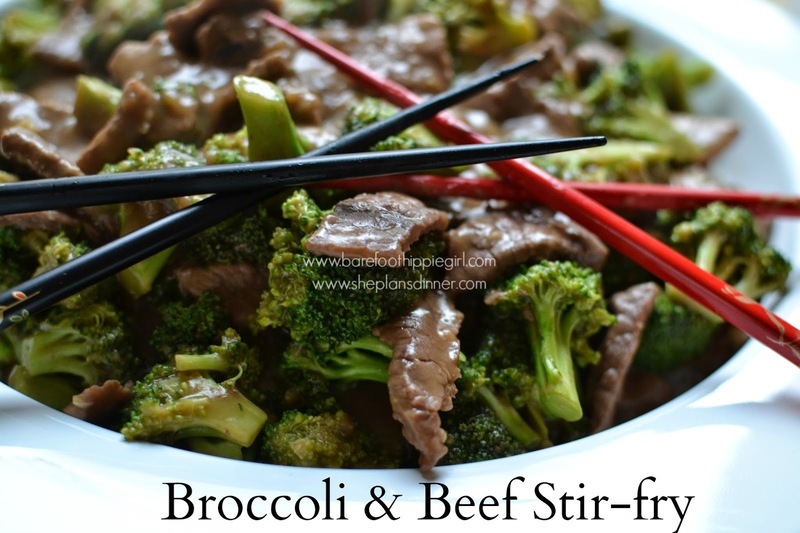 Beef and broccoli are in the star position. Garlic and ginger provide the flavor. There is not a lot of chopping-which is always a plus when you are in a hurry. -Chop the broccoli. Cut the steak into bite sized pieces. Mince garlic. -In a small bowl, combine the flour, beef broth, and soy sauce. Stir until the flour and sugar is dissolved. 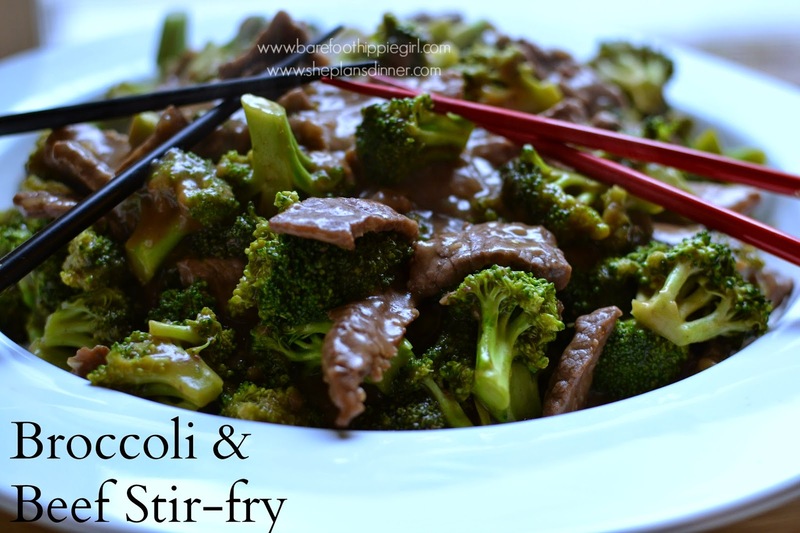 -In a large skillet over high heat, cook and stir beef 2 to 4 minutes, or until browned. Stir in the broth mixture, ginger, garlic and broccoli. Bring to a boil, then reduce heat. Simmer 5-10 minutes, or until sauce thickens. What's your favorite stir-fry recipe?